American and British pop music have a lot in common besides a language. There are some styles, notably straight-ahead rock and roll where it's hard to tell from which side of the Atlantic the artist hails. Other genres can have a distinctly American or British flavor. There are endless numbers of trendy British pop styles going back to the Beatles, and over the decades also including varieties like art-rock and peculiarly British dance crazes. Although it can be argued that the British got all their rock & roll influences from the US in the first place, there are some styles which have remained distinctly American, such as R&B and the folk-based singer-songwriter genre. The English have tried both, but the results come out with a distinctly UK accent. As far as folkies go, the Brits developed a unique style back in the late 1960s through groups like Fairport Convention, that continues to this day. This week's album is by a British folkie who has developed a very American style and sound. 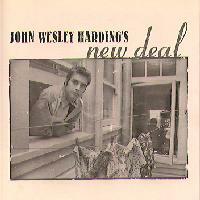 He is John Wesley Harding, and his latest recording is entitled John Wesley Harding's New Deal. Wesley Harding Stace assumed the name of the famous American outlaw immortalized in Bob Dylan's song when he began performing. Interestingly one of his early influences was another British Isles performer with an American sound, Elvis Costello, and early in Harding's career, many observed the similarity between his and Costello's vocal sounds. Also inviting comparison was the presence of two of Costello's band members on two of Harding's albums. Despite Costello's shadow, Harding began to distinguish himself in the late 1980s with a somewhat folkier sound and lyrics that occasionally tended toward the more political, also in the American folkie tradition. Since then, Harding has been developing a reputation for his insightful songs that are full of great wordcraft and attractive pop melodies. Now as he is approaching his thirtieth birthday, Harding has come to America for his new album, and ends up sounding even more like a folksinger from this side of the Atlantic. There's a mainly acoustic backing, largely absent drums, and full of the kind of articulate and introspective lyrics that singer-songwriters from Jackson Browne to John Gorka have made their stock-in-trade. On the other hand, this album is rather less political than some of Harding's more recent works, such as his outstanding 1993 release Why We Fight. There are a few love songs, but much of this album consists of little vignettes about characters, in varying degrees of haplessness. New Deal was recorded in the San Francisco Bay area, and was co-produced by Chris von Snidern, who himself is an adroit singer-songwriter with a pop disposition. It's a generous collection of thirteen compositions that run from personal relationships with a twist to songs that do attempt to take on the state of the world. The accompaniment is exceptionally tasteful and understated. There is occasionally a drummer heard, but the rockiest tunes often lack percussion and convey their musical energy because of the song itself and the presence of some electric guitar. But just as often you'll hear a cello or violin, or a little steel guitar adding a hint of country. One can also occasionally hear a little Beatles influence in some of the arrangements. The new release entitled John Wesley Harding's New Deal is another outstanding recording from the British-born singer-songwriter whose voice sounds a bit like Elvis Costello, and who occasionally borrows bits of Beatles influence in his musical arrangements, but who is sounding more and more like an American folk-style singer-songwriter. New Deal continues Harding's tradition of exceptionally fine lyric writing, both in terms of the way he puts words together, and the way he treats his subjects, which he can often turn into telling observations about the world in general. He is an appealing vocalist and this album features a scaled-back, mostly acoustic instrumental setting that contrasts with his previous, more electric work. He is also a bit less political this time around. The result makes for exceptionally fine listening. One thing I miss is a printed lyric sheet in the CD booklet, but Harding is quite intelligible, and repeated listenings to his music will engender a greater appreciation for his wordcraft. From a technical standpoint, the album is competently done with a clean mix, unencumbered by excessive studio effects. The sound, like the album's contents is fairly understated, and comes to be appreciated more with time. John Wesley Harding is one of the best singer-songwriters to come out of England in the past several years, and his New Deal, with its American recording venue and musical style, underscores that position. After several releases for major labels, now Harding has gone the independent route at least here in America, perhaps explaining this album's lack of commercial concessions. It is one of the finest recordings from a performer who continues to win more fans, but still, I think, deserves wider recognition.